This chapter presents the study of the degradation of nanocomposites made of poly(D,L-lactide-co-glycolide) and calcium carbonate. The first section of the chapter describes the materials and methods employed in this work. 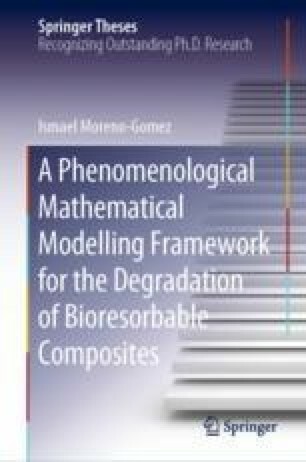 The second section includes the characterisation of the raw materials followed by the characterisation of the undegraded and degraded composites in the third and fourth sections, respectively. The discussion of the results is reported in the fifth section and lastly, the conclusions in the sixth and final section.